246 pages | 28 B/W Illus. Minimising the most severe risks of climate change means ending societal dependence on fossil fuels, and radically improving the efficiency with which we use all energy sources. Such deliberate transformative change is, however, without precedent. Sustainable Urban Energy Policy debates the major public issue of developing a sustainable, clean and affordable energy system by adopting a distinctive focus on heating in cities. 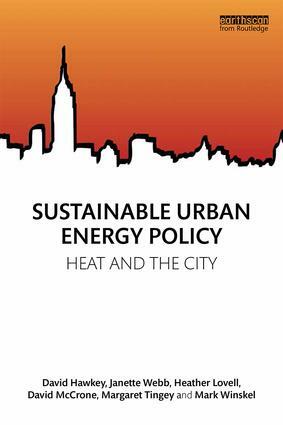 In this way, the book constructs an original account of clean energy policy, politics and provision, grounded in new empirical data derived from case studies of urban and multi-level governance of sustainable heat and energy saving in the UK and Europe. Offering an original conceptual framework, this study builds on socio-technical studies, economic and urban sociology, human geography, applied economics and policy studies in order to understand energy governance and systemic change in energy provisions. This book is a valuable resource for students and academics in the areas of Science and Technology Studies, Sociology, Geography (Urban Studies) and Political Economy as well as energy policy makers, social housing providers and energy practitioners. PART I Overview 1. Introduction 2. Social studies of technology, energy systems and modern societies PART II Policy and Politics for Sustainable Heat 3. European heat policies and practices4. From optimisation to diversity: Changing scenarios of heating for buildings in the UK5. Implementation of district heating policy in the UK PART III Cities and Urban Centres: Resources, Expertise and Sustainability Challenges 6. Business Models for District Heating Networks: Economics, Finance and Risk7. Urban Energy Governance for Sustainable Heat in UK cities: expectations, practices and potential8. Assessing Local Government Engagement in Energy Systems Development in the UK and its Likely TrajectoriesPART IV Affordable and Sustainable Warmth for Housing 9. Paying for energy – understandings of home, well-being and affordable warmth 10. The surprising outcomes of UK energy and climate policy: zero carbon housing targets and the emerging opportunities for district heating PART V Conclusion 11. Solutions? Cities and carbon innovation – coordination for sustainable heat. David Hawkey is a Research Fellow in the School of Social and Political Science, University of Edinburgh, UK. Janette Webb is Professor of Sociology of Organisations in the School of Social and Political Science, University of Edinburgh, UK. Heather Lovell holds joint positions as an Associate Professor in Sociology at the University of Tasmania, Australia, and as Reader in the School of Geosciences, University of Edinburgh, UK. David McCrone is Emeritus Professor of Sociology, and co-founded the University of Edinburgh's Institute of Governance in 1999. He is a Fellow of the British Academy and a Fellow of the Royal Society of Edinburgh, UK. Margaret Tingey is a Research Officer and PhD student in the School of Social and Political Science, University of Edinburgh, UK. Mark Winskel is Chancellor's Research Fellow on Energy Innovation in the School of Social and Political Science, University of Edinburgh, UK.